A direct-shift gearbox (German: Direkt-Schalt-Getriebe), commonly abbreviated to DSG, is an electronically controlled dual-clutch multiple-shaft manual gearbox in a transaxle design, without a conventional clutch pedal and with fully automatic or semi-manual control. The first actual dual-clutch transmissions were derived from Porsche in-house development for their Model 962 racing cars in the 1980s. In simple terms, a DSG is two separate manual gearboxes (and clutches) contained within one housing and working as one unit. It was designed by BorgWarner and is licensed to the Volkswagen Group. By using two independent clutches, a DSG can achieve faster shift times and eliminates the torque converter of a conventional automatic transmission. 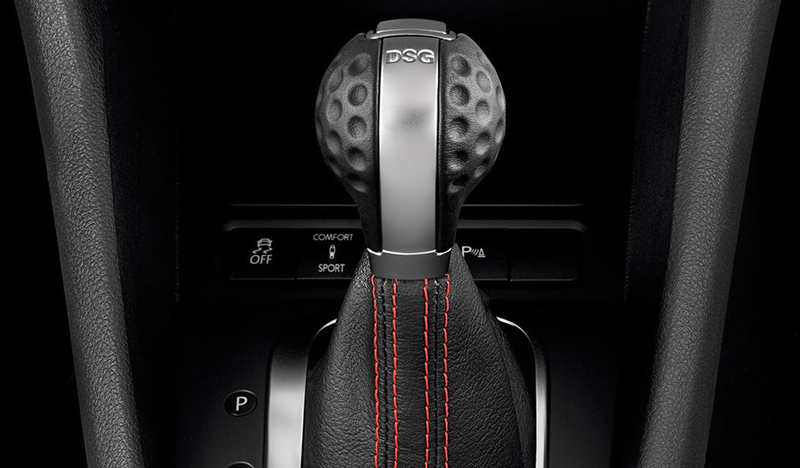 There are a several variations of DSG's across the VAG vehicle range. Some DSG gearboxes lead themselves more to tuning than others so to help determine which gearbox you have, we have listed the types below along with a short description. On most Audi models, the DSG is referred to as an S-Tronic gearbox. It can be quite confusing as the normal Torque Converter Autos are also sometimes called S-Tronic as well. DQ250 02E / 0D9 - This is fitted to most 6 speed DSG models from 2003-present. At the time of launch in 2003, it became the world's first dual-clutch transmission in a series-production car, in the German-market Volkswagen Golf Mk4 R32, and shortly afterwards worldwide, in the original Audi TT 3.2 and the 2004+ New Beetle TDI. For the first few years of production, this original DSG transmission was only available in transversely oriented front-engine, front-wheel-drive and Haldex based four-wheel-drive vehicle layouts. The first DSG transaxle that went into production for the Volkswagen Group mainstream marques has six forward speeds (and one reverse) and uses wet/submerged multi-plate clutch packs. The two-wheel-drive version weighs 93 kg. DQ200 0AM / 0CW - At the start of 2008, another world-first 70 kg seven-speed DSG transaxle became available. It differs from the six-speed DSG, in that it uses two single-plate dry clutches (of similar diameter). This clutch pack was designed by LuK Clutch Systems. This seven-speed DSG is used in smaller front-wheel-drive cars with smaller-displacement engines with lower torque outputs, such as the latest Volkswagen Golf, Volkswagen Polo Mk5,and the new SEAT Ibiza. It is also fitted to the Caddy 1.6 TDI models. It has been paired to engines with up to 250 Nm (180 lb/ft). It has considerably less oil capacity than the six-speed DQ250, the DQ200 uses just 1.7 litres of transmission fluid. Unfortunately we are not able to tune these for more torque holding due to their 'dry clutch' design. DQ380 0DE - Mainly used in the Golf 7 GTI China. This gearbox is a smaller version of the DQ500, which can be found on the Audi RS3/TT-RS. DQ381 0GC - Mainly fitted to the Audi S3 and Golf 7 R. The DQ381 is the 4-wheel drive version of the DQ380, and is a smaller version of the DQ500. DQ500 0BH / 0BT - This is a heavier transverse 7 speed DSG and is built to support up to 600 Nm (440 lb/ft). It can be found in the VW Transporter, Tiguan, Audi RS3, TT-RS and Q3. DL501 0B5 - In late 2008, an all-new seven-speed longitudinal S tronic version of the DSG transaxle went into series production. Initially, from early 2009, it is only used in certain Audi cars, and only with longitudinally mounted engines. Like the original six-speed DSG, it features a concentric dual wet multi-plate clutch. However, this particular variant uses notably more plates - the larger outer clutch (for the odd-numbered gears) uses 10 plates, whereas the smaller inner clutch (driving even-numbered gears and reverse) uses 12 plates. Another notable change over the original transverse DSGs is the lubrication system - Audi now utilise two totally separate oil circuits. One oil circuit, consisting of 7.5 litres , lubricates the hydraulic clutches and mechatronics with fully synthetic specialist automatic transmission fluid (ATF), whilst the other oil circuit lubricates the gear trains and front and centre differentials with 4.3 litres of conventional hypoid gear oil. This dual circuit lubrication is aimed at increasing overall reliability, due to eliminating cross-contamination of debris and wear particles. The factory rate the torque handling limit of up to 600 Nm (440 lb/ft), and engine power outputs of up to 330 kW (450 PS; 440 bhp), but up to 1000 Nm. It has a total mass, including all lubricants and the dual-mass flywheel of 141.5 kg. Most DSG Gearboxes have a set torque limit of 360nm (265ft/lbs) meaning tuned cars will be limited to this figure even if the engine is wanting to produce more. We can increase this torque limit to 500nm (368ft/lbs) or in some cases remove it completely. Even in manual mode the DSG gearbox will automatically change up at a set RPM. This doesn't always suit everyone's driving style and can be quite annoying. We can set this to a higher RPM or disable it completely. Ideal for track or fast road use. To get the perfect set off we are able to reprogram the DSG to a certain RPM limit when stationary. When set at the correct RPM limit the car will have a perfect balance of power and grip to get a quick set off with minimal amount of wheel spin.